This composite, multi-spectrum picture of the Cigar galaxy (M82) includes images taken under the visible light spectrum by the National Optical Astronomy Observatory’s 2.1-meter telescope at Kitt Peak in Arizona and in the x-ray spectrum by NuSTAR and the Chandra X-ray Observatory. 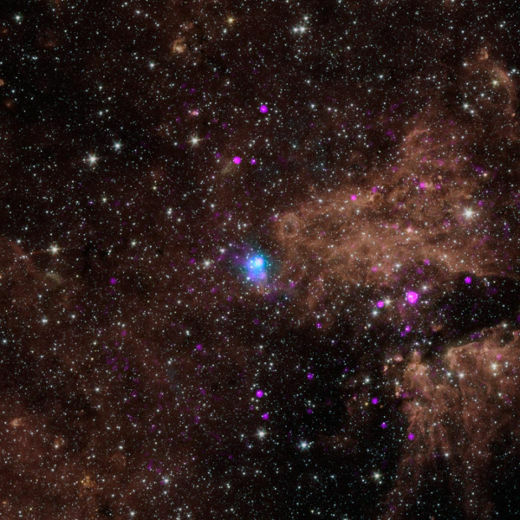 The magenta coloured center represents high-energy x-rays streaming from a rare and brightest to date pulsar which is also known as an ultraluminous x-ray source, or ULX. Low-energy x-ray data from NASA’s Chandra X-ray Observatory are coloured blue while the higher-energy x-ray data from NuSTAR is the pink areas of the image. 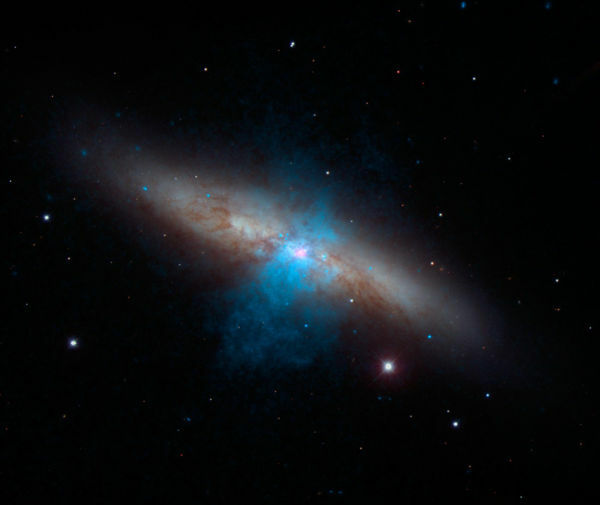 NASA’s NuSTAR mission spotted some pulsing x-rays from this ULX (called M82 X-2) leading scientists to discover this pulsar (a pulsar is a type of neutron star that sends out rotating beams of high-energy radiation). NASA’s Nuclear Spectroscopic Telescope Array (NuSTAR) was able to discover this pulsar (PSR J1640-4631) by picking up the rotating beam of X-rays that were originating from its blue center. This pulsar lies in our inner Milky Way galaxy about 42,000 light-years away and its X-rays intersect Earth every 0.2 seconds. While the blue dot in this image marks the spot of this high energy pulsar (3 to 79 kiloelectron volts), the pink dots in this picture show low-energy X-rays (0.5 to 10 kiloeletron volts) detected by NASA’s Chandra X-ray Observatory. This dramatic x-ray image is of a pulsar wind nebula, which is powered by the leftover, dense core of a star that blew up in a supernova explosion. Electromagnetic radiation is being expelled and the interaction with magnetic fields creates a cloud that looks like an open hand. The actual pulsar is the smaller, highly magnetized white area in the picture while the blueish portion is the structure of the high energy x-rays. The red cloud at the end of the finger region is referred to as RCW 89. 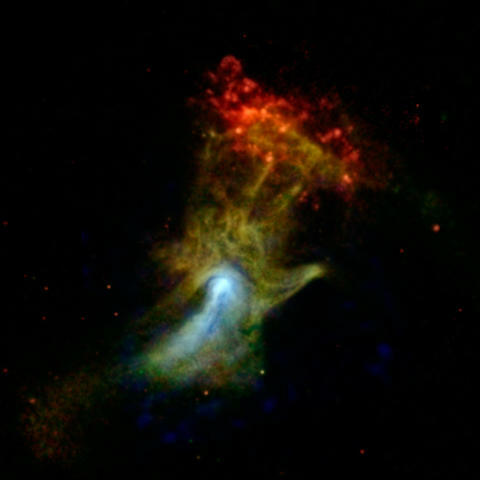 NASA’s Nuclear Spectroscopic Telescope Array, or NuSTAR, was used along with the Chandra X-ray Observatory to compile this image.